Allan gives the character such a petulant tone it is difficult at times to like him but it’s also a reminder that for all his skill and intellect, he’s still a child in many ways. He finds an unexpected kinship with Raven, finding his own struggle as Ra’s al Ghul’s grandson is reflected in her relation to an actual demon. As is often the case with the Teen Titans, things are kept from being too dark by the perfectly timed comedy from Beast Boy (Brandon Soo Hoo). Blue Beetle (Jake T. Austin) also makes a welcome reappearance and is central to Damien’s understanding of control and calm in battle. The Justice League feel much like supporting characters but that shouldn’t be taken as a criticism. Jason O’Mara continues to provide a stalwart Batman whose fierce façade is only slightly compromised by his still new role as a father. As the voice of Superman, Jerry O’Connell injects liveliness and humor into the Man of Steel that make it even more upsetting when he’s the first to be taken over by one of Trigon’s demons. As we’ve come to expect from these films, the design and execution is perfectly on par. With the much darker tone of DC’s film and most of their TV endeavors, Justice League vs. Teen Titans is refreshingly lighter fare, even with demons and hell beasts aplenty. “The animated Justice League team, they’re experts,” said O’Connell. Separately, many of the other voice actors said the same and rightly so. 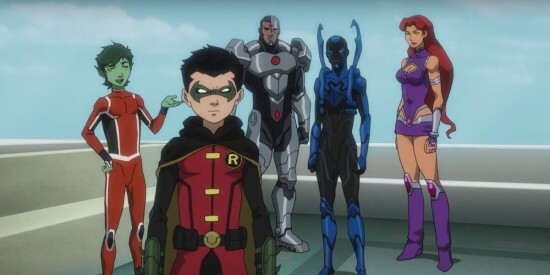 The film provides a smooth transition for Damien to stick with the Teen Titans and leave Batman partner-less once again. Hopefully that means more of O’Mara on solo Batman films and Allan teaming up with the Titans for their own adventures. If the audience at WonderCon is any indication, they’re ready for it. Directed by Sam Liu, with character design by Phil Bourassa, Justice League vs. Teen Titans arrives April 12 on Blu-ray and DVD.